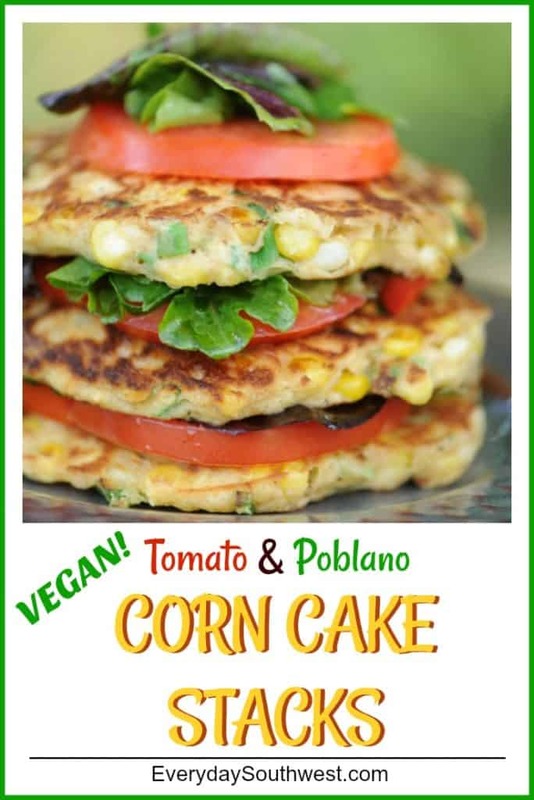 This Corn Cake Recipe is proof that healthy food can be delicious food. Corn fritters cooked “pancake style” then, stacked with ripe tomatoes and fresh salad greens turn this corn recipe into a fast and easy weeknight meal or special dinner. Corn fritters are one of my favorite childhood food memories. The little round crunchy balls of fried dough drizzled with syrup where a special treat. Donna has found a way to pack big corn fritter flavor into a healthier, faster corn cake that can be eaten anytime. We started blogging together in the fall 2009 and Donna posted this recipe in our very first year, September 2010 to be exact. It has been a fan favorite ever since! I have updated Donna’s post to include keywords, tags, an easy to use recipe plugin, more photos and all of the “tech-y” things that will help you and our Southwest foodie friends find this recipe more easily. The recipe itself has not been changed from the yummy corn-filled original. “I agree with America’s favorite radio host that corn – while sweet and fresh – is one of the very best simple pleasures of life. When I bite into a steamy ear dripping with butter and salt, IÂ just want to stand up and shout “Life is GOOD!” Naturally, I am always looking for easy recipes that will enhance corn’s golden goodness. 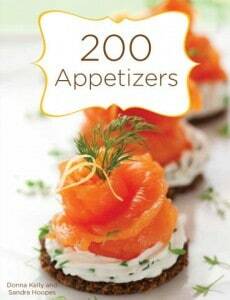 Especially easy, flavorful and healthy meals. Yes, I did use the word “healthy,” which corn is when eaten in its whole state. Who says you can’t do Meatless Monday on the grill? There are two schools of thought on corn fritters: deep fry them so they’ll be globe shaped, or make them pancake style. I think you can tell by the photo which style I chose. That way, you can make a pretty stacks with a little dressed arugula and some ripe tomatoes. 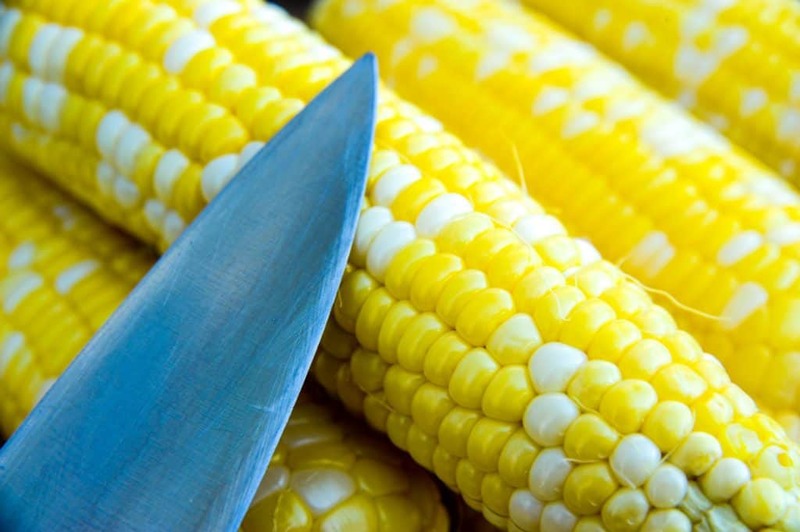 And, a bonus: this easy dinner takes 20 minutes, max – even if you have to shuck the corn! You can find Donna and more of her recipes on ApronStringsBlog.com where she blogs with her daughter, Anne. Choose the freshest corn you can find. Locally grown is usually best. Grill the corn in the husk with silks removed- (Sandy’s most used method) Peel the outer green husks down to expose the “silks” of the corn making sure that the husk stays attached to the stalk or end of the corn cob. Remove the silks and discard. Rinse the corn with cold water then, fold the husks back over the corn. Place the corn on the coals or on a rack above the coals or a rack above the flame of a gas grill. This method is good for roasting corn in the oven at 400 degrees. Grill the corn without the husk- Shuck the corn completely by removing and discarding the husks and the silk of the corn. Rinse the corn with cold water. Place the corn on a lightly oiled rack above the coals or gas flame. Do not place the corn in the coals. This method gives the corn a delicious grilled flavor and allows you to keep your eye on the corn while it cooks. Turn the corn as it cooks so it will have grill marks but not burn. Cook between 8 to 12 minutes. Prep all of the ingredients before you begin cooking each corn cake. The corn cakes should be warm with a slight crispiness to the outside when served. To keep the each corn cake warm by placing them in a single layer on a sheet pan lined with parchment paper or a rack. Place sheet pan in a warm oven (about 100 to 150 degrees). 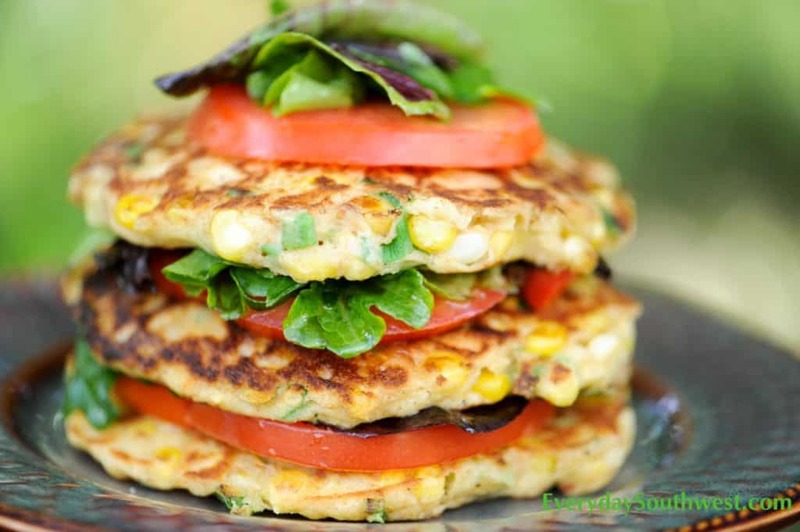 Assemble the Corn Cake Salad Stacks by placing a corn cake on the center of each plate. 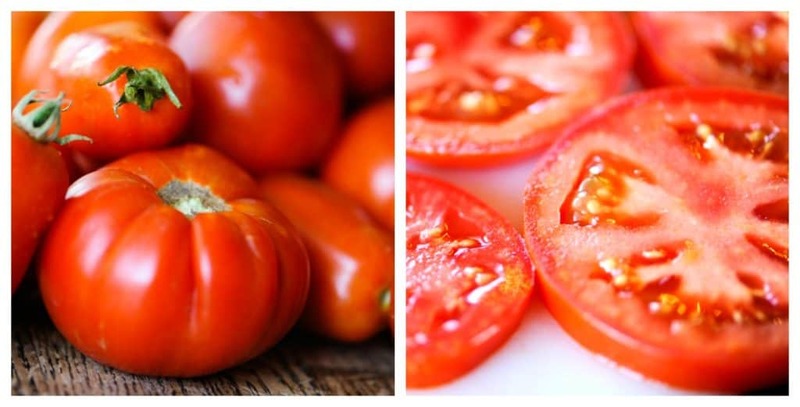 Layer on a tomato slice, diced or sliced poblano and salad greens. Repeat the layers ending with salad greens on the top. TIP for salad greens: You may toss the salad greens in a very light but very tangy vinaigrette. Just use a small amount of dressing so it adds a tart flavor without making the corn cake soggy. Season with salt and pepper between the layers. Assemble the Corn Cake Salad Stacks at the last minute so that they have the wonderful contrast of warm corn cake and chilled salad. Combine flour, baking powder and then stir in milk, egg, corn kernels, green onion and hot sauce. Heat a large skillet to medium high heat and spread a little butter in skillet. Drop 1/4 inch mounds of batter into pan and then flatten into 1/2 inch thick cakes. Cook as you would cook pancakes, until golden brown on each side. Serve stacked with alternating layers of fritters, tomato slices, poblano slices and arugula. * TO MAKE A GLUTEN-FREE VERSION, REPLACE A P FLOUR WITH 1/4 CUP BROWN RICE FLOUR AND 1/4 CUP CORNMEAL. I hope you love this recipe! We do! If you have any questions about this recipe or any other question about Southwest food, please leave a comment here on the this post OR can alway me on Everyday Southwest’s Facebook Page. For Southwest recipes delivered right to your email, subscribe to Everyday Southwest’s RSS Feed. Look for me on Pinterest for more great recipes. Such a tasty recipe! I grilled the corn as suggested and the corn was so wonderfully sweet. Made them like pancakes and they cooked up quickly and perfectly. Definitely making again and again this summer.